City Gold – One of the most common name when we talk Entertainment @ Ahmedabad. Over the years City Gold has achieved the mark of achieving the best standards in the field of Entertainment with its spread expanded entirely in the geography of the Megacity. The group is promoted by well known Realty Developer Group known as Agrawal Builders managed by Res. Shri Chimanbhai Agrawal and Mr. Sanjay Agrawal. 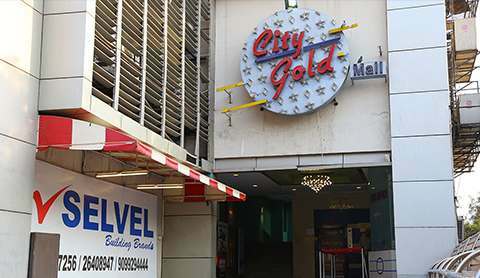 City Gold is Preferred movie destination for its target customers with a strong brand loyalty. McDonalds 1st outlet opened up in Gujarat @ City Gold. Apart from this, other well known brands like Pizza Hut, Havmor, Cinemasala, Unplugged, Brand Factory, D’Mart etc. are associated with City Gold. The City Gold Mall at Shyamal has a 4 screen multiplex with a seating capacity of 495.